Friday’s Guardian, in an article about the imminent demise of Delhi’s autorickshas, described their drivers as ‘surly, betel nut-chewing and overcharging.’ It was ever thus. Paul Stiff has pointed out the fear of being ‘dished’ by a cabman that haunted visitors to Victorian London. 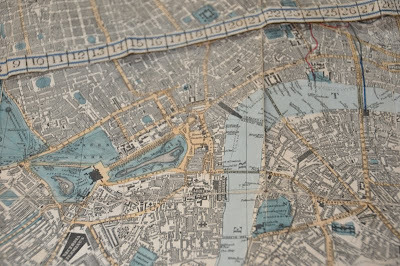 And the Designing information before designers exhibition points out one of the answers: an ‘indicator map’, complete with measuring tape, that allowed you to ascertain the exact distance, and therefore the reasonable fare, between any two points in London. Edit The new issue of Baseline 58 has an article with colour illustrations of many of the items in the exhibition.